Hello my dearest readers! I told you I had some new series of posts to share with you. Over the years I have collected polishes that for one reason or another didn’t make it to the blog. Usually because they were discontinued right after I got them, I picked them up in destashes, or they were limited edition. Now, the polishes I will show you in this series may not be readily available however, they do pop up in second-hand sales in groups or blog sales from time to time so I have decided to go ahead and show you these anyway. 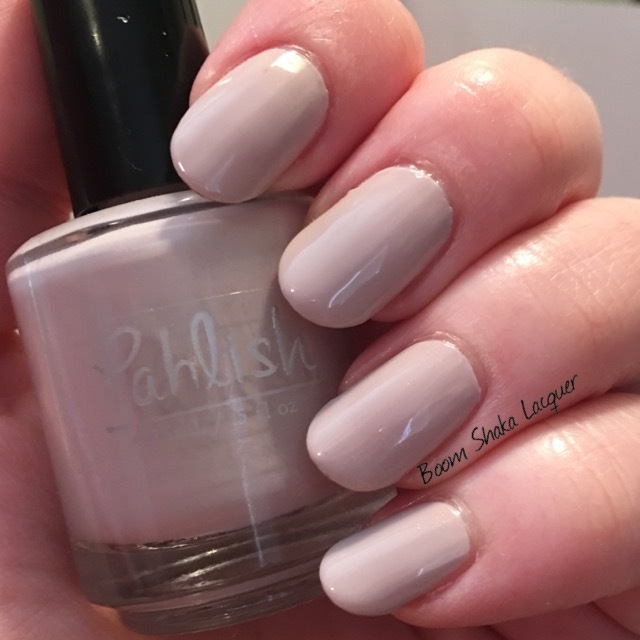 I’m starting this series with a relatively new trio, however, it was part of Pahlish’s Bespoke Batches which are by their very nature limited edition. Today I am going to share with you the River Song Bespoke Trio! River Song is hands down one of my favorite Doctor Who characters and I can tell you that when this trio came out I knew I had to have it! 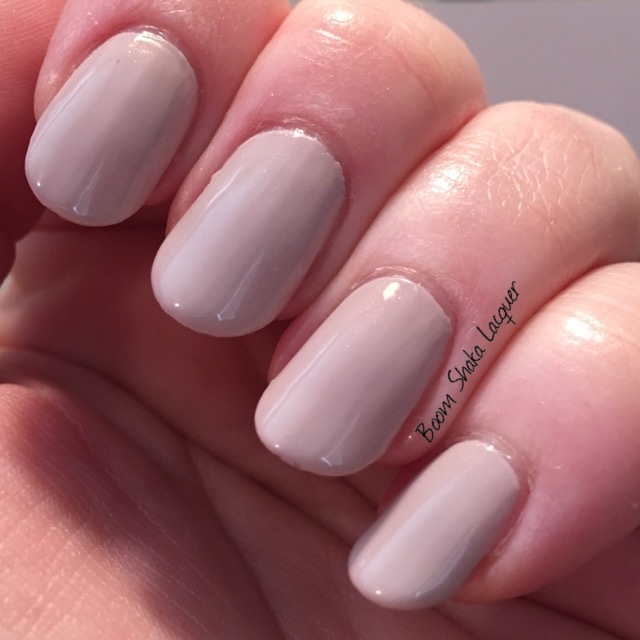 Penny in the Air is a beautiful cream colored creme polish with a subtle copper shimmer throughout. It’s a fantastic neutral with a slight blush from the shimmer. 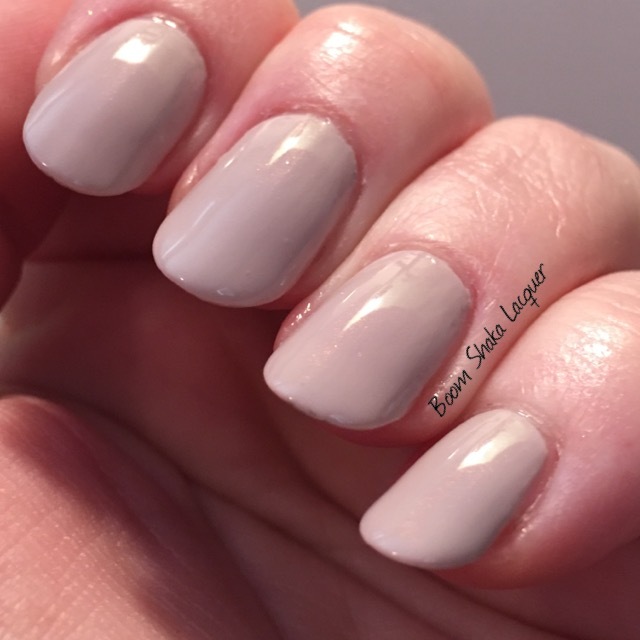 This is a perfect neutral for me and I struggle with them a lot because I’m pale as can be. I really loved how this one worked for me. Penny in the Air went on beautifully, flawlessly, and is wonderfully self-leveling. I tried desperately to capture some of the shimmer and you can kind of see it a little bit. Trust me though it’s there. Pictures show two coats plus topcoat. Be still my heart. I’ve discovered my love for purple in the past couple of years and this one is just really perfect and I don’t have anything else like it in my collection. Now ya’ll know, because I keep saying it, I prefer holographic polishes that have a little something something extra going on! 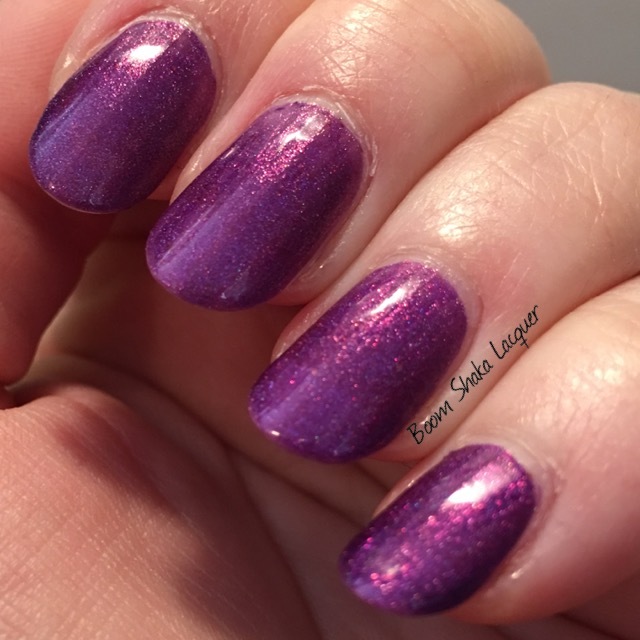 This is a purple linear holographic polish with a strong pink shimmer and microflakies. How could I not love it? The formula on this was absolutely fabulous. No complaints here whatsoever. This was almost a one coat wonder, I think had my nails been a little shorter I could have gotten away with one coat. Pictures show two coats plus topcoat! This polish is EVERYTHING. I love it so much I’m kicking myself for not picking up back up bottle. Hallucinogenic lipstick is a juicy raspberry jelly polish filled with purple iridescent glitter and some scattered holographic sparks! I’m totally in love with this. It’s squishy, gorgeous, and utterly girly. I really can’t say enough about the formula on this. It’s opaque in two coats but retains all the squishiness that I love about jelly polishes. It’s a smooth application and no issues to report. It *is* highly pigmented so moisturized cuticles and a patient hand will keep you from having an issue with clean up. While these are no longer available there are tons of other great Pahlish polishes that are available! I highly recommend following Pahlish on social media so that you can see all the gorgeous goodies that she has coming up. Pertinent Links below! Until next time my lovely readers, may your days be filled with Glitter and Flakies! 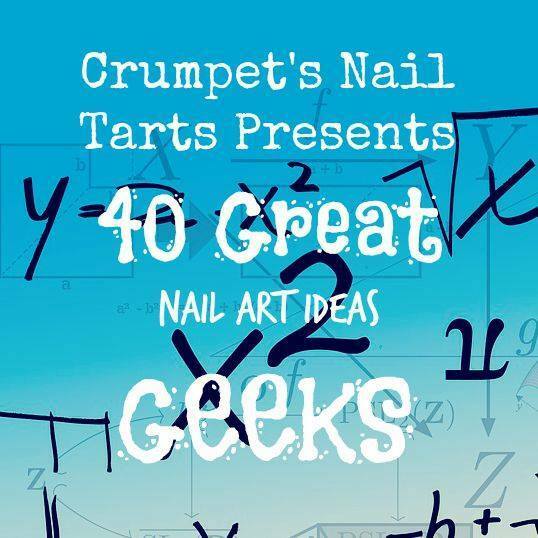 40 Great Nail Art Ideas – Geek Week! Yes my dear readers. This is by far and away one of the weeks I was looking forward to the most! We all know where it’s going to go right? I have a love for so many pop culture things but by far and away I like the geeky shows and books the most. Sherlock, The Walking Dead, Firefly, Dr. Horrible’s Sing-along Blog, Lord of the Rings, Supernatural, The Hunger Games (books not movies), Harry Potter (books not movies), Agents of S.H.I.E.L.D., Arrow… Do I really need to continue? I think you get the idea! Anyway I did not mention the one that has the biggest piece of my heart and that’s Doctor Who of COURSE! So today you’ll get to see a homage to the 11th Doctor (I’ve been wanting to do this one for awhile but never had a good time or reason to). Now, the 11th Doctor (played by Matt Smith) was not necessarily my favorite Doctor. But, I grew to love him despite a rocky beginning. By the end I was just as sad and cried just as hard to see him regenerate as with earlier Doctors. *sniffles* Ah the feels. Ok enough of that! Onto the nail art! Bow ties are cool! 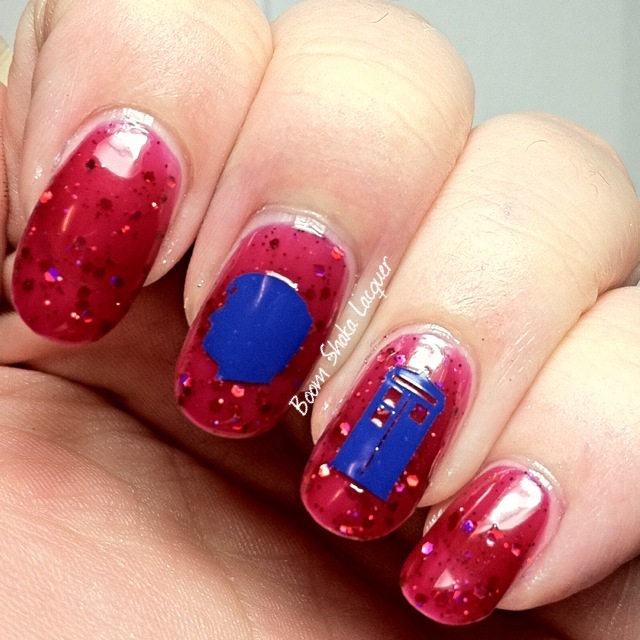 I knew the minute I saw this stamp that it would become part of an 11th Doctor nail art look! I’m sure that it’s not meant to be bow ties (it comes from a Christmas-themed plate) but it’s so very like the red bow ties that the 11th Doctor wore so well that I could not resist. To get this look I started by painting my fore and middle fingernails in a plain white (I used Sinful Colors – Snow Me White, I know I know it’s not indie but I do use mainstream white and a few other plain colors for stamping and such right now). I then painted my ring and pinkie fingernails with A Study in Polish – Not Our Division. 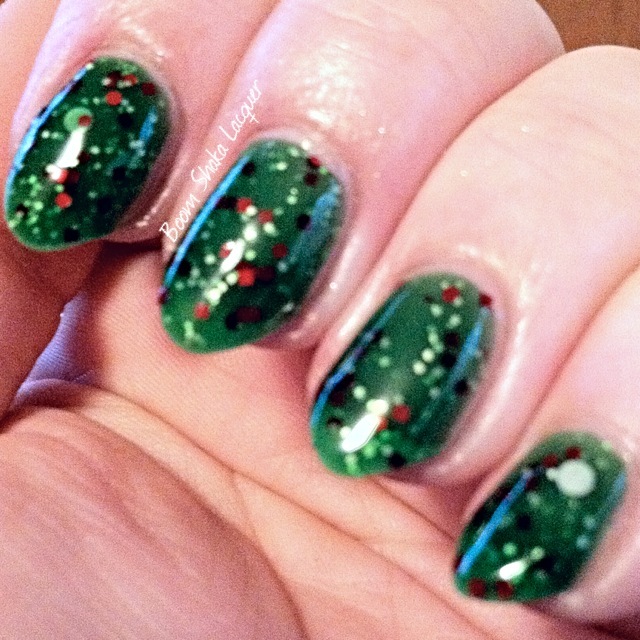 I let that dry a bit then I came back in and on the first two fingers I stamped the “bow tie” design from the Cici & Sisi – Christmas 2014 plate using Octopus Party Nail Lacquer – Universal Loner. On the last two I stamped a star design from Bundle Monster – BM20 in silver (Sally Hansen – Silver Sweep, don’t judge!). Of course I couldn’t stop there. I needed to add an awesome 11th Doctor profile and a TARDIS vinyl from YouPolish! Top coat the whole thing and voila, a fitting homage to the 11th if I do say so myself! I was really happy with how this one turned out. Don’t forget to check out the InLinkz below to see the rest of the amazing nail art that is turning up for Geek Week! Until next time may your days be filled with Glitter and Flakies! 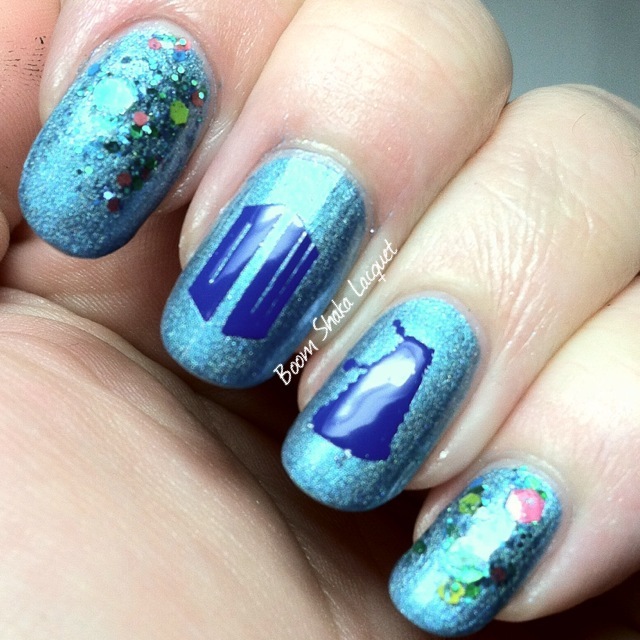 Doctor Who Day Preparation – Featuring YouPolish Vinyl Nail Decals!! My dearest readers, please allow me a moment of flailing as I get ready to write this post…. Ok I’m good now. So, Lauren from YouPolish approached some bloggers she had worked with in the past and said “Hey, what kind of vinyl nail decals would ya’ll like to see?” Well surely you know what I asked for, even if the title HADN’T tipped you off you should have known what I would ask for! 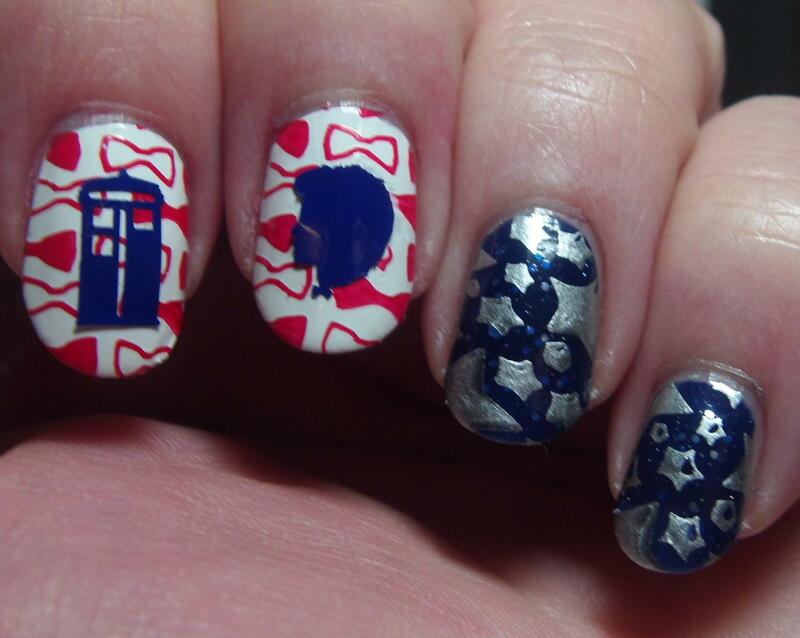 You got it… Doctor Who themed nail decals. Be still my hearts. So YouPolish got some amazing iconic Doctor Who images ready for you to dress up your digits on August 23rd! Who else is counting the minutes? What about seconds? Just me? Alrighty then…well let’s get onto the pictures! Since I wanted to show you the variety of decals I opted to pair them with some appropriate Doctor Who themed polishes from my collection! First up are the TARDIS and The Tenth Doctor’s profile! Of course as you Whovians all know, Life is Short and You Are Hot is a line uttered to Sally Sparrow in the episode Don’t Blink and that the Angels had the TARDIS! This was during the Tenth Doctor’s run as well. Oh the feels. This is the Eleventh Doctor’s profile and I put it on with Softening the Bad Things by L13L. This polish is based on the episode Vincent and The Doctor and is when I finally fell in love with Eleven. It took me awhile to get over losing Ten but Eleven really won me over in this episode. While I’m eager for the New Doctor I am still very emotional over losing Eleven! Well we just couldn’t have Doctor Who themed decals without a DALEK! This is probably my favorite of the decals because Daleks really are the penultimate bad guy in Doctor Who. These decals are awesome. They are easy to apply, stick well, and come in a host of colors! The only one I didn’t show here was Nine’s profile which is just as awesome as all the rest. I really like the variety of images and I can’t wait to do my mani for the Series 8 Premiere on August 23rd! You can get these decals (and so many others!!!) from YouPolish and they should be available today! To get your own decals you can visit YouPolish’s Shop! To keep up with all the news and pictures you can follow them on Facebook and Instagram! 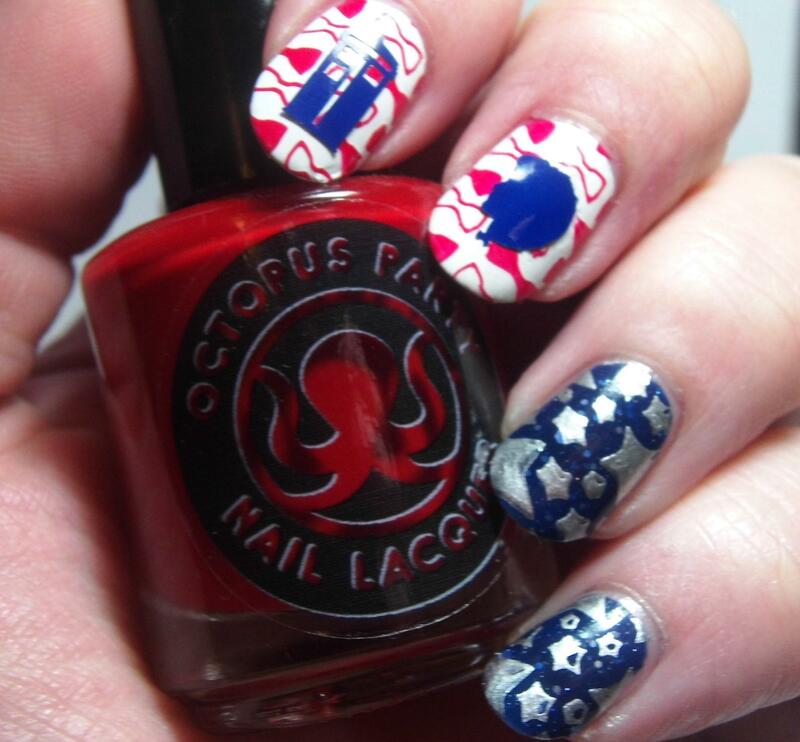 This entry was posted on August 1, 2014, in Doctor Who, Fandoms, Indie Polish, Nail Art, YouPolish. My dearest readers this post is going to conclude my mini-series on my Black Friday purchases! Today we’re going to probably have some sad and happy feels and there will definitely be pretty polish. 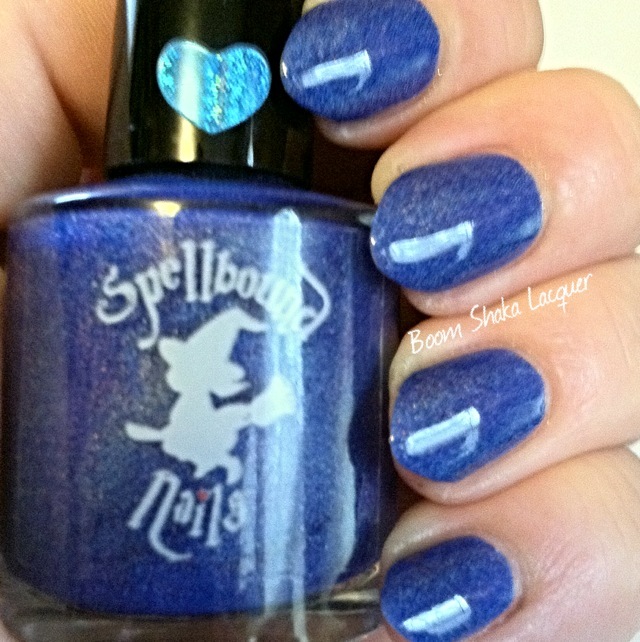 Let’s look at some Spellbound Nails shall we? First up I have Zombie Guts! I was excited to try this polish. It’s just the sort of thing that I really love, jelly based? CHECK! Glitter? CHECK! Geeky/Nerdy/Zombie references? CHECK! 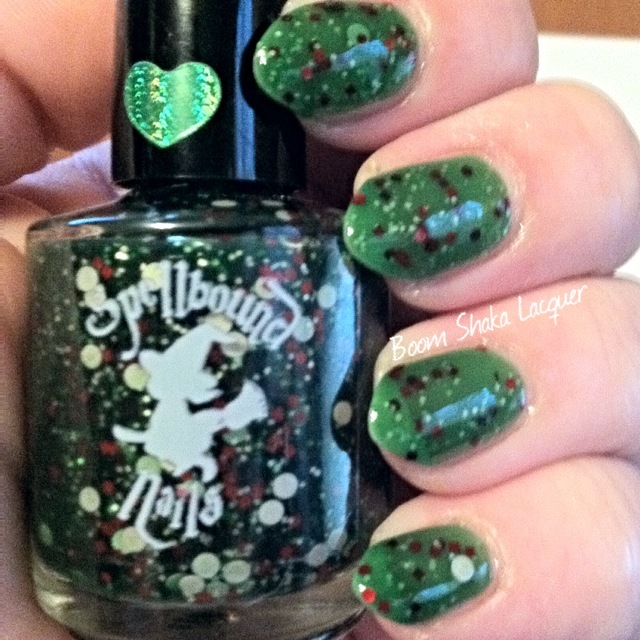 I think that if I was imagining Zombie Guts as a nail polish that this is just the kind of thing I would come up with! This polish is a true green jelly-based glitter polish filled with small metallic red square and dot glitters, medium matte white dots, and iridescent lime (or light) green micro-glitter. 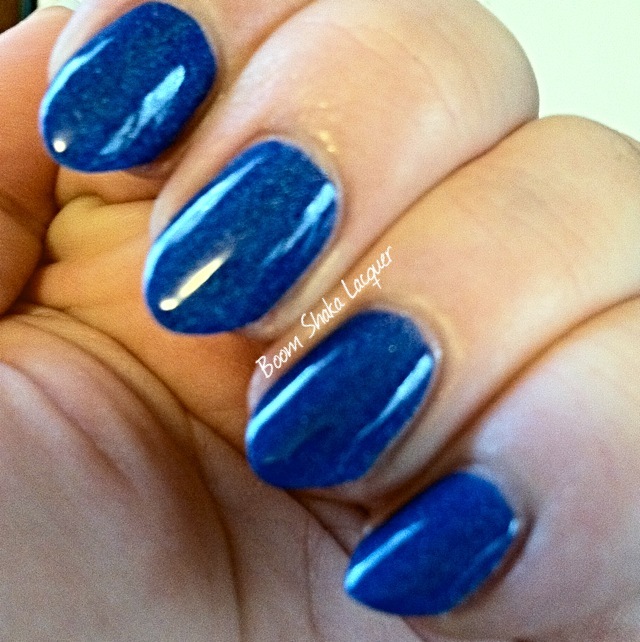 This polish is just as squishy as you would expect from a jelly polish! Application was good, though I did have to fish just a bit for the bigger glitters. I’m no stranger to this however and I didn’t find it to be a problem at all. The polish dries to a satiny finish but I shined it right on up with a glossy topcoat! On these pictures it appears that there is an ever so slight VNL however that was not apparent to me in person. Picture shows three coats plus topcoat! 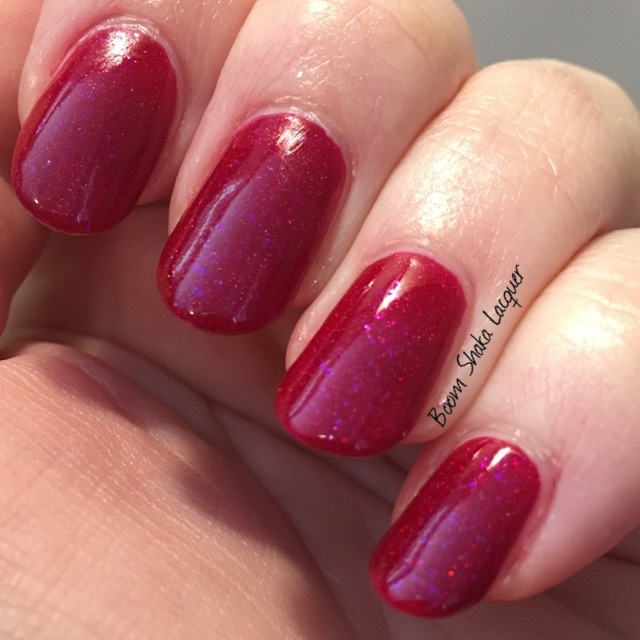 Next up we have a polish inspired by the 11th Doctor (remember me mentioning the sad feels?) Let’s all take a moment and remember how awkward and wonderful he really was. I can’t wait to see what Capaldi does as the 12th Doctor but I really will truly miss 11 far more than I thought I would back when he was crashing into little girls’ yards and getting them to cook up everything in the kitchen to find out what he wanted to eat. There’s this moment when the Doctor swoops in to pick up River early on in his travels with Amy and River lands the TARDIS and says “we’ve landed” and 11 is indignant and states that of COURSE they haven’t landed and she proves it and then he becomes distressed and wants to know why it didn’t make the sound. The sound that EVERY Doctor Who fan knows. River’s response is that it’s not supposed to make that sound but that the Doctor…Leaves the Brakes On! I sort of, but not really, feel bad for that lengthy introduction. But, that’s what you get when you get me going about Doctor Who! 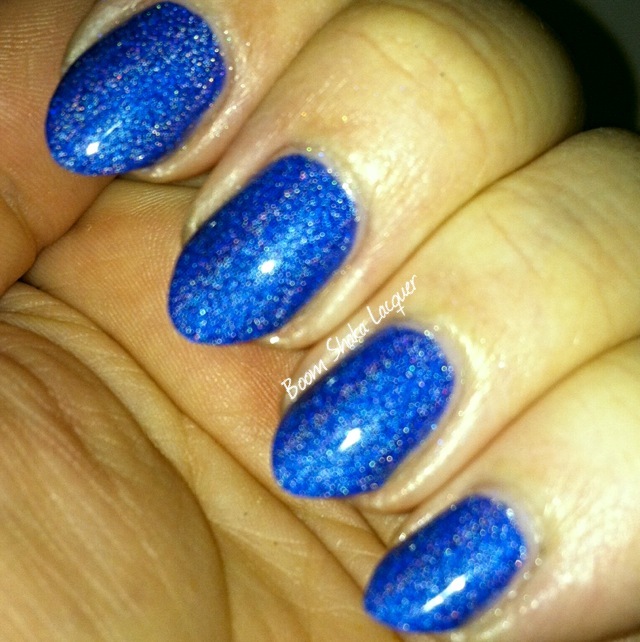 This is Leave the Brakes On, a beautiful TARDIS blue jelly/crelly holo! This blue may actually be the closest to TARDIS blue that I have in my collection or that I’ve seen in general. I knew as soon as I saw it that I was going to have to have it. I say that it’s a jelly/crelly holo because the base is not a creme base but more in line with a jelly or crelly base. It has a bit of squishiness that you don’t get from a true creme base. The holo is evident but not so strong that it blinds you while driving down the road. Application was lovely and pictures show two coats plus top coat. Here’s a picture with flash so you can see the holo effect! So sparkly! This is a Limited Edition polish and she’s said that once it’s gone it may not be remade due to a particular pigment that she used being discontinued so I definitely think you should snag it up! All in all I’m super pleased with these polishes from Spellbound Nails and I’ll definitely be visiting her shop again! You can keep up to date on all of the goings-on by visiting their Facebook, Blog, or Instagram. You can purchase Spellbound Nails in their Etsy and Storenvy shops! Right now you can pre-order her beautiful Victorian Valentine collection until January 17th!